I guess I never did a write-up on the local Compass Box tasting at Sportsman’s I went to a couple of months ago. I’ll have to pull out my notes and do that. That tasting serves as a good example of why I love to get out there and be a part of the “whisky community.” First, I got to try Spice Tree, which still hasn’t made it to Arizona. Second, I scored the last few milliliters of a miniature bottle of The Last Drop (along with the bottle) from one of the guys at the store. It was only around 7 or 8 ml…just enough for one swirl around the tongue and down the hatch. But hey, at $2,000 a bottle, and only 348 bottles imported to the U.S., just being able to take a whiff of it was a special treat, let alone taste it. Three industry veterans scoured the Scottish countryside before happening upon the three casks that make up this release in an Auchentoshan warehouse. The casks contained a blend of around 70 malt whiskies and 12 grain whiskies, originally distilled in 1960 or earlier. In 1972, then blended whisky was moved into fresh Sherry butts where it sat until being “discovered” in 2008. This truly is a rarity, and a one of a kind bottling. For more on the story, check out this interesting article Bostonist.com, or check out the various information pages at lastdropdistillers.com. Not a tasting note, but check out the color in the picture. I don’t believe I’ve quite seen that shade of brown in a Scotch whisky before. On the nose, the first thing that hit me was that I seemed to be smelling a bourbon, not a Scotch. A very nice bourbon, mind you. It’s sweet, with dark fruit, cinnamon and toffee. Definitely oaky, like you might get from a really good 17-20 year bourbon. You can tell it was aged in sherry casks, too, but I don’t think I would ever guess 36 years worth. On the palate, it coats the tongue nicely, with a reasonably thick feel. So smooth and easy on the tongue, yet still very present, with a nice tingle on the sides of the tongue like there’s a bit of pepper, followed by drying. Argh…after nosing this periodically for a couple of weeks before finally drinking it, I sure wish I had more than a few ounces so I could give it another go! The finish is where this whisky stops seeming like a bourbon, and asserts itself as a very old scotch whisky. It’s what i imagine a 30 year old Aberlour a’bunadh would be like. Again, my small sample is gone all too quickly, but fortunately, it’s lingering for a good long time. I mentioned a theoretical 30 year Aberlour a’bunadh in the “finish” notes. Based on my very small sample, if I were to try to come up with my own recipe to mimic this blended scotch, it would be a vatting of Parker’s Heritage Golden Anniversary bourbon and a little bit of that imaginary 30 year a’bunadh. Maybe it’s because I’ve really come to appreciate good bourbon lately, but this whisky hit all of the right notes for me. 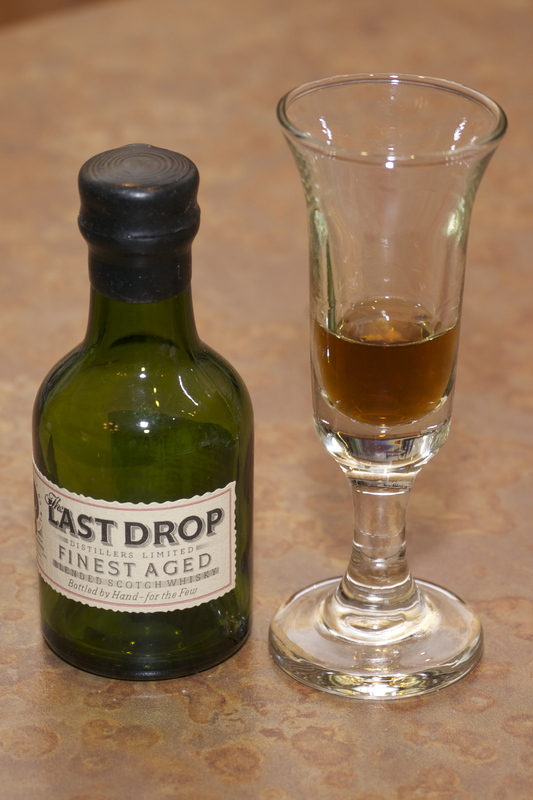 The Last Drop combines a great story with a rich, yet accessible taste. It’s one of those whiskies that you can sit with and nose in the evening while listening to your favorite music and contemplating life. Even better, it would be a great whisky to share with close friends on a special occasion. It’s so well balanced and free of “nasties” that any whisk(e)y drinker should be able to enjoy it. Granted, some will find it lacking if they prefer certain big flavors like peat, but that shouldn’t stop them from being able to enjoy it. What’s especially unique about this whisky is the way it can appeal to both bourbon and scotch drinkers. I’ve never tasted anything quite like it, and I guess there’s a good chance I never will again. A HUGE thank-you to Bill at Sportsman’s for letting me try this. very exclusive and very interesting story . thanks jeff for the lovely write-up. sadly, those events are rare over here, with the limited whisky market and the pricing is crazy. Thanks Gal. It’s definitely an interesting whisky. I think you’re doing a good job making up for your limited local market by embracing the online community and making lots of connections. You’ve certainly been able to order some nice releases, and lately, it seems you’ve gotten quite a few samples. Good stuff! last drop is the deeply final touch.